The Social Accountability 8000 (SA8000) is the first global standard for corporate social responsibility. SA8000 is promoted as a voluntary, universal standard for companies interested in auditing and certifying labour practices in their facilities and those of their suppliers and vendors. It is designed for independent third party certification. SA8000 is based on the principles of international human rights norms as described in International Labour Organisation conventions, the United Nations Convention on the Rights of the Child and the Universal Declaration of Human Rights. It measures the performance of companies in eight key areas: child labour, forced labour, health and safety, free association and collective bargaining, discrimination, disciplinary practices, working hours and compensation. SA8000 also provides for a social accountability management system to demonstrate ongoing conformance with the standard. The SA8000 certification consultancy is provided by Punyam Management Services, which helped organization to get certified through independent organizations accredited by Social Accountability Accreditation Services (SAAS). A facility wishing to seek certification to SA8000 must apply to a SAAS-accredited auditing firm, known as a Certification Body. SA 8000 Certificate is issued by Certifying body, which is accredited to provide certificate under the SA 8000 standard. The SA 8000 certificate is issued for the period of 3 years after successful completion of pre–assessment and registration (Final) assessment. Surveillance audits are conducted by the Certifying body within the period of 3 years at the interval of 6 Months, 9 Months or 12 Months depending upon the nature and size of the Organization. The SA 8000 certified workplaces are required to make public their SA8000 certification and can display their certificate in a store or a factory, in company advertising, and on company stationery. The standard is composed of following 9 SA8000 requirements which must be follow by any organization while implementing SA8000 system in their organizations. 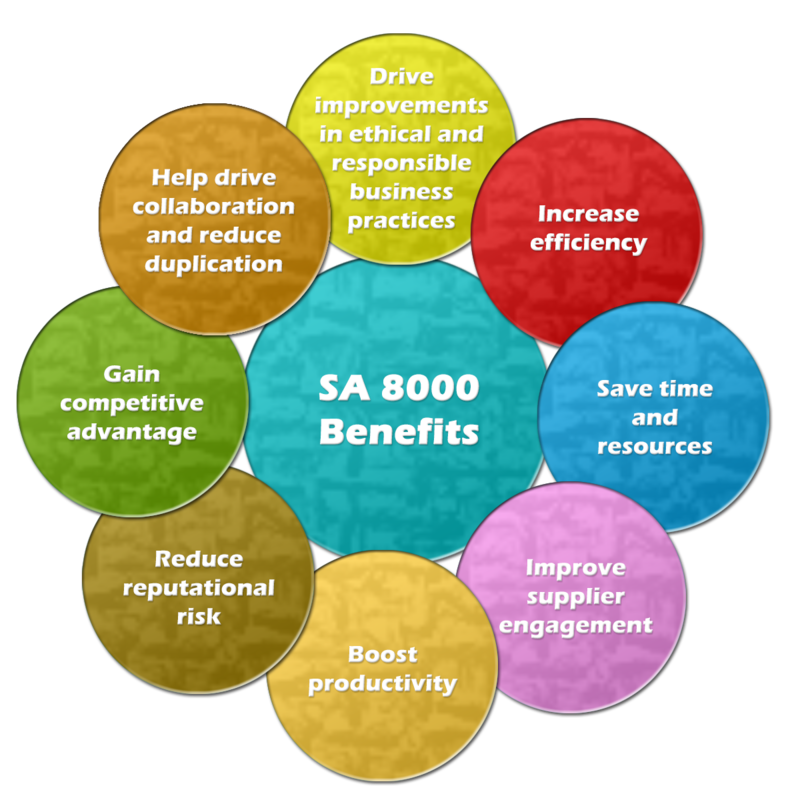 Following are the key benefits of SA8000 System that organization can achieved with the implemention in their work place.